The former prime minister says all the parties should embrace what she believes is a successful negotiation with an unpredictable and adversarial U.S. administration. 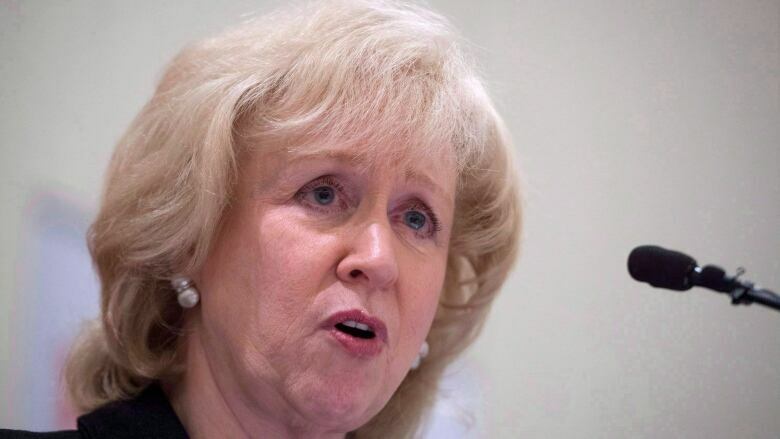 The Conservatives should stop criticizing how the Liberals negotiated the new North American trade agreement, and instead trumpet their contribution in striking the deal, says former Canadian prime minister Kim Campbell. In reacting to the new United States-Mexico-Canada Agreement (USMCA), Conservative Leader Andrew Scheer said "Canada has failed to achieve progress on key issues, while giving ground to the U.S."
But Campbell, who served in Brian Mulroney's cabinet during the original NAFTA negotiations, says Canada "managed to fend off what could have been a disastrous threat to our economy" from U.S. President Donald Trump. She spoke to As It Happens host Carol Off. Here is part of their conversation. Was this week's signing of this new trade deal a little bit of déjà vu? Personally, I gave a sigh of relief because, you know, things could have been much worse and we're dealing in kind of uncharted territory here with this new president. So what is really different, though, from NAFTA? Because what's being criticized is that, well, "What did we really get?" The economy is very different now from what it was 25 years ago when NAFTA was negotiated. So I think it's not unreasonable to say that there should have been some discussion about the modern digital economy and intellectual properties, all of those issues. And I think those were dealt with, and I don't think we lost too much. Of course the big to-do will be over the question of access to our dairy, to our supply-managed industries. But the interesting thing is that the percentages are very small — just a tweak more than had already been negotiated in the TPP. And also, the American dairy market is now open to us. So there was a bit of reciprocity there. That could be kind of interesting. What do you make of the kind of heavy criticisms from Andrew Scheer and his fellow Conservatives about this deal? I think that it's a bit cheeky for the Conservative leader to suggest that his party could have done better. [Former Conservative industry minister] James Moore and [former Conservative interim leader] Rona Ambrose were part of the advisory committee. You know, this was not a single-party negotiating strategy. To the extent that we've managed to dodge the bullet, I think all parties should take credit for it and not nit-pick. I want ask you a question about [being] a female politician at the time, in the '90s ... and how bruising it often was for women in politics. It was a real boys' club that was negotiating that deal: both FTA and NAFTA. What did you make of [Foreign Affairs Minister] Chrystia Freeland and her style? It just seemed to me that she's very professional. The interesting thing about Chrystia Freeland is that she had the trade portfolio before she went into foreign affairs, so she had that period of time where she probably had a chance to really get her head around these issues. The fact that the prime minister asked her to lead the process is not surprising. Would it have been surprising for a woman to be leading the negotiations back in the '90s or the '80s? [Former PC cabinet minister and senator] Pat Carney would like you to think that she played an important role in the negotiation and probably did, and thinks that sexism resulted in her being expunged from the record. That's right. She was shut out, wasn't she, of the whole historical record of that? I wish I could say I didn't think there's any sexism in that interpretation but, you know, I think there is and I think that she did a great and a professional job. If I were the Conservatives, rather than getting my teeth into the government's ankles, I would get Rona Ambrose and James Moore talking about the process and the role that they played because it was a multi-party exercise, and very good people from the Conservative Party were key to the process. On other occasions, you might get some traction from saying, "We would have done better." But I don't think anybody's going to believe that given the nature of the American leadership at the moment. I think we should say, you know, good on us that we we really managed to fend off what could have been a disastrous threat to our economy by someone whose understanding of trade is not, you know, the most current thinking. Do you really think that Donald Trump was serious that he was going to tear up NAFTA? I think it was a real risk. And who knows what would have set it off? Our people — without not being who we are, you know, without becoming toadies — they stood up for Canadian values. And some people thought they stood up for them too much. But they did, and lived to tell the tale.